Speaking of short term memory...what was I just talking about?! 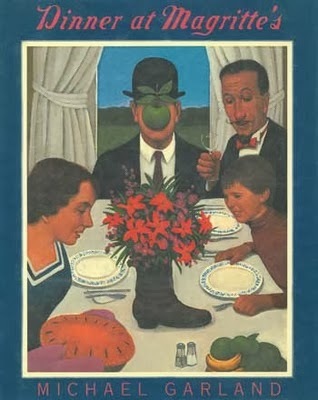 Ah, yes, Magritte. I do remember I told you that this particular project is like the gift that keeps on giving. 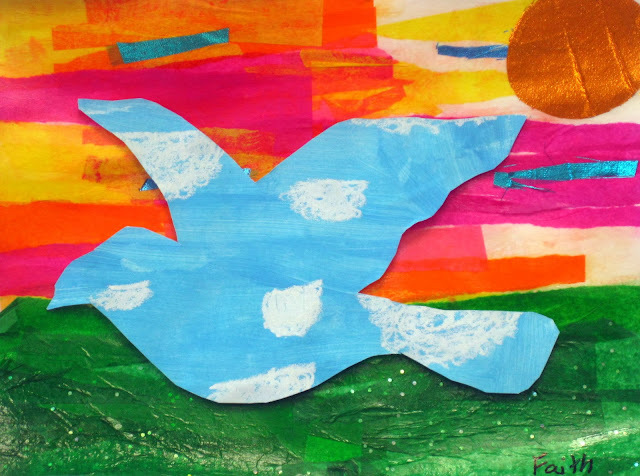 Because after the kids cut out their day and night birds (go here if you are confused), it turns out I only needed one for their mural. Any more and it woulda looked like a scene outta Hitchcock's The Birds. This left them with either a cloud-filled or star-studded bird for the project you see here. 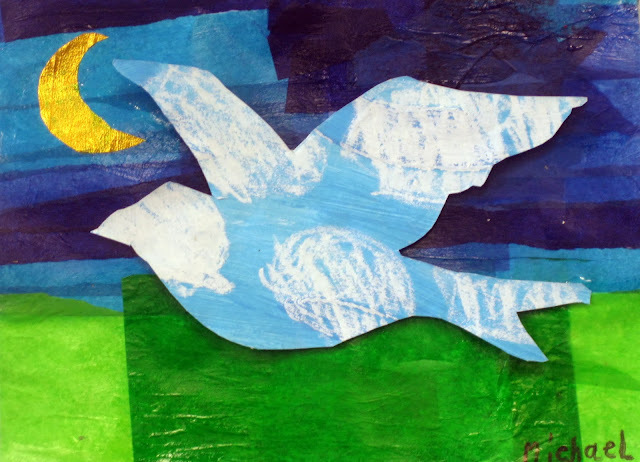 Magritte's The Return was the inspiration behind these small works of art. And, by small, I mean the paper was 9" X 12". We usually work twice as large in the art room despite our half an hour art class time constraints. But I had a sneaky suspicion that this whole tissue-paper collage thing just might take for-evah. Turns out, like sooo many things, I was right (hubs, are you reading this?! Say it with me: I. Was. Right. I know this has nothing to do with you, I just like to hear you say it!). This spin-off project turned out to be a hit with the kids. 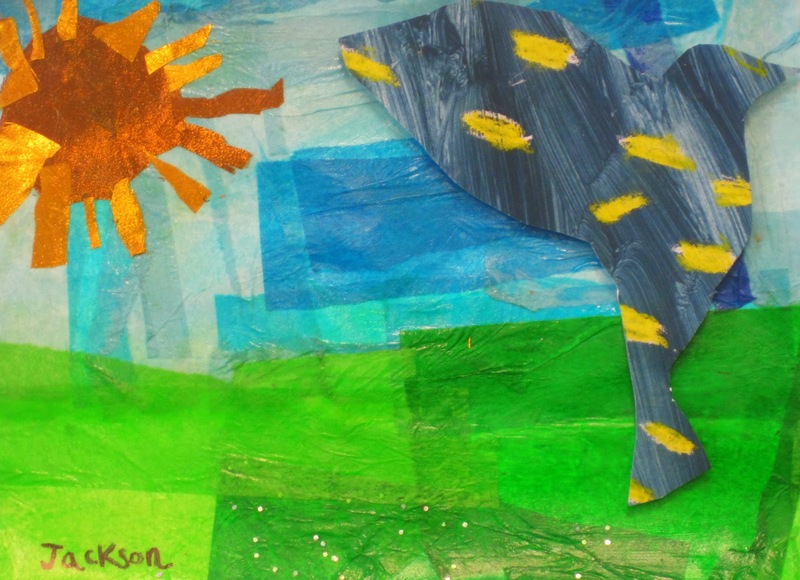 They learned about analogous colors, creating contrast, making a collage landscape all while working with an art material they'd not used in a long time: tissue paper. Lemme tell they went about creating these works of art. Bonus: You'll hear the story about how a third grader taught me the correct name of my favorite art supply. Deep stuff, I know. Read on. In my last post, I told you about how the kids were given 12" X 18" pieces of paper on which they were to paint a tint of blue and a shade of blue. 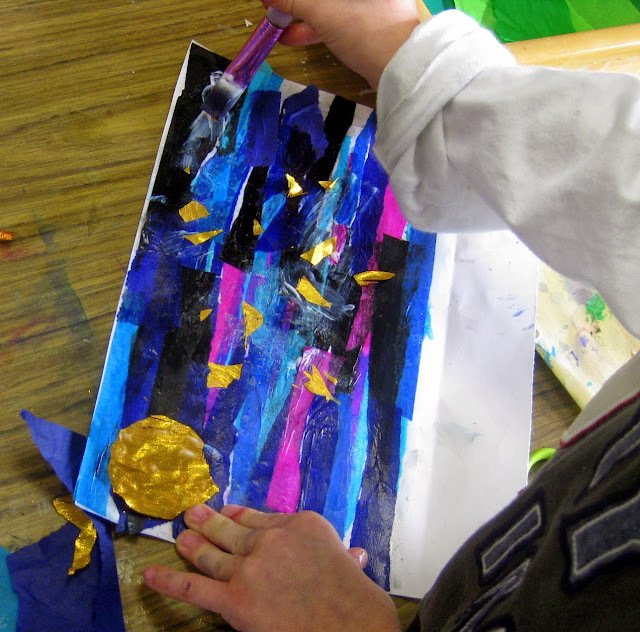 These colors were premixed so that the colors in our mural would be consistent. I know, I'm a control freak. 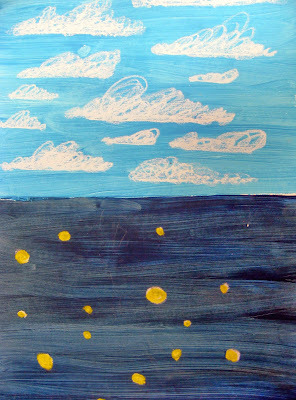 Once those were dried, the kids added clouds and stars in oil pastel. From there, they flipped their paintings over and traced the day and night bird templates on the back. This yielded two birds, one for the mural, one for this project, and an awesome negative paper to be used in the future. Me: WHERE IS YOUR MESSY MAT?! Me: YOUR. MESSY. MAT. You're getting Modge Podge all over the table. Kid: Oh, sorry...(attempting a distraction technique) but don't you like my beautiful nighttime sky? Yeah, I do. Le sigh. Those kids. They get me everytime. 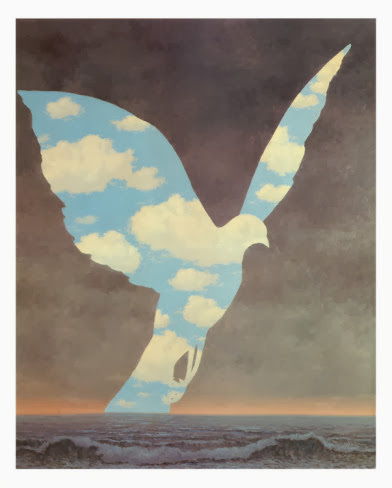 On the first day of this project, we looked at Magritte's The Return and had a long chat about two things: contract and analogous colors. 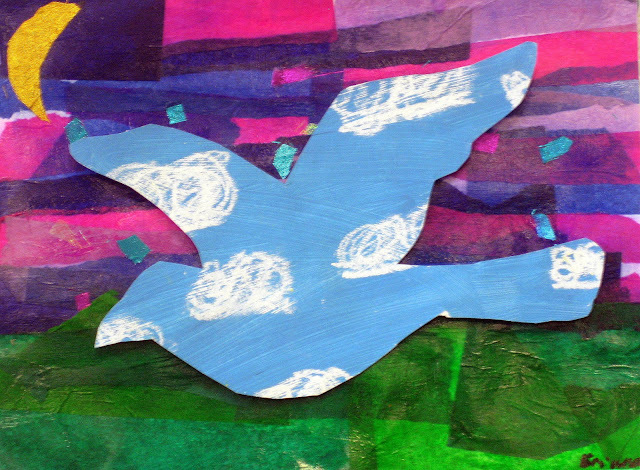 We noticed how Magritte used a contrasting sky to make his bird stand out. Then we talked about ways we could do that in our sky without making just a blue daytime or black nighttime sky. This led to a chat about the different times of day and the colors you might see. Then I focused on the color wheel. I told the kids that they were to choose four pieces of tissue paper that were analogous in color. I placed a color wheel on each table to help them along. Once their four colors were chosen, they were to hold the tissue paper up in the air so the rest of us could see what they'd chosen and decide if there were indeed analogous. From there, they commenced tearing the paper into strips. Now, just a note on that. I noticed that the paper has a grain. Meaning it will tear in nice long strips going one way, but the other direction it tears in short pieces. There is no way to know the grain, it's just a matter of tearing. Torn pieces of tissue were kept in labeled envelopes for the next class. And a note on adhering the tissue paper. 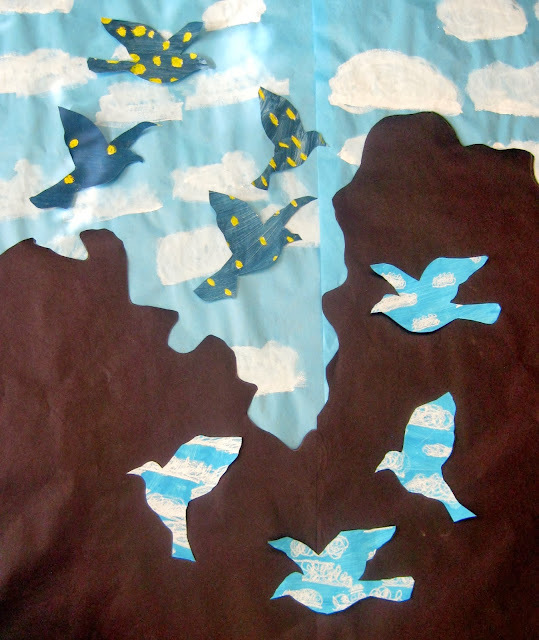 I asked that the paper go horizontally as clouds would move across the sky. I demonstrated how to apply a thin layer of varnish to the paper, place tissue on top and then apply another layer. When applying second layer, start in the middle of the tissue paper and brush outward. This prevents those annoying and unsightly crumpled pieces of tissue paper. I had folded the paper so there was about 2-3" at the bottom for the horizon line. Once their sky was complete, the kids could dive into my massive box of sparkly fabric and create stars, a moon or a sun and clouds. This was applied in the same manner as the tissue paper. By the second art class, most skies were complete. For the land, the kids were to choose two different colors of green (a couple even opted for green fabric), tear into large pieces and adhere to the bottom. This took them no time at all. 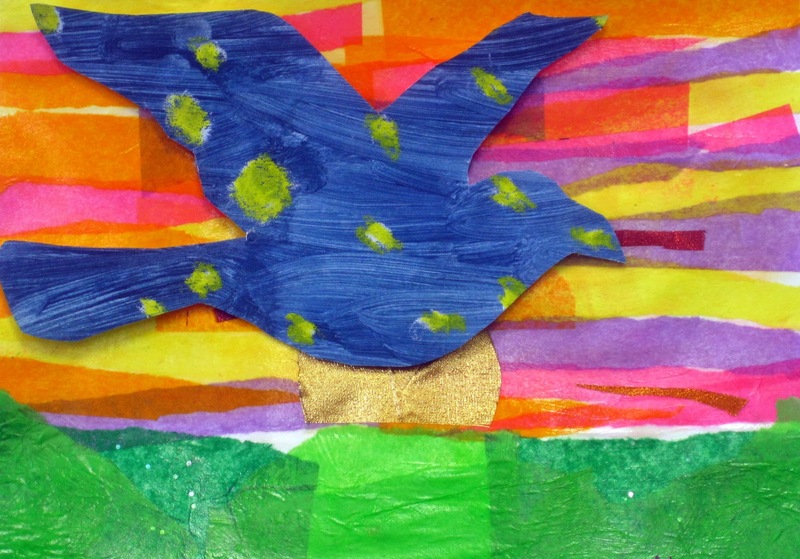 Once their landscape was complete, the kids were to glue their birds. I had them play around with the placement of the bird until they settled on a composition they liked. For a little pop, I used my paper cutter to slice a million little pieces of foam core. 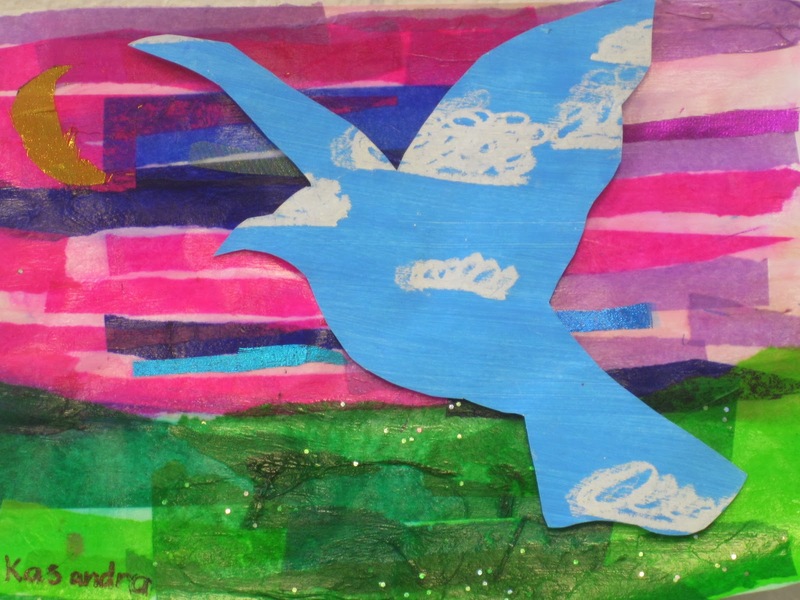 The kids glued about 5 pieces of foam core to the back of their bird and then glued that to their piece. I love the subtle 3-D element and it also introduced the concept of relief sculpture to the kids. Now I know some of ya'll are stick-sun haters but how you gonna hate on this? Kid: Mrs. Stephens, why do you call that stuff "Modge Podge"? Me: (holding up the jug of stuff so the kid could see the label) Because that's what it's called, see? Kid: Then why does it say MOD Podge?! And that's when my teeny-tiny brain was blown. I looked at the label and, sure enough, the stuff that I'd been calling Modge Podge for years is indeed called MOD Podge. Wah-hut?! How in the world did I not catch that? It's toootally got that rad 1960's mod-style label. Please, puh-lease tell me I'm not the only one that's been calling it that. And please tell me why none of yous never corrected me on my ignorance? Have all ya'll been laughin at me (more than normal) behind my illiterate back?! JUST as I suspected, humph! Whatevers. This Thanksgiving, I'm placing MOD Podge on the long list of things I'm thankful for...my lack of reading skillz, not so much. Speaking of, I hope you have a wonderful Thanksgiving, friends! And, if you don't celebrate such, just pat your bottle of Mod Podge fondly on the head and think of me. I'll be back soonish with an embroidery project I'm just Thankful to be finished with. Ya'll might recall that we are experiencing a bit of Magritte-madness in the art room. 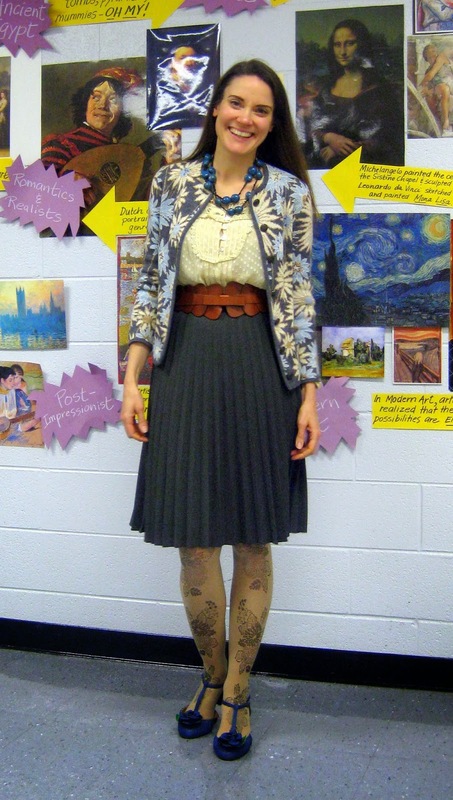 It started when I settled upon him as our Artist of the Month, got all surreal and wore this Magritte-inspired get-up to school and decided the third grade could/should create a mural as epic as this one by our fourth grade. And, standing at 9' X 12', weighing in at 10 lbs, I'd say this thing went beyond epic and hit Mammoth Magritte-dom. Which is perfect for my third grade as this thing is as big (and surreal) as their personality. The whole thing started when I hung up this piece by Magritte for the kids to chat about during our "What do you SEE? THINK? WONDER?" time. 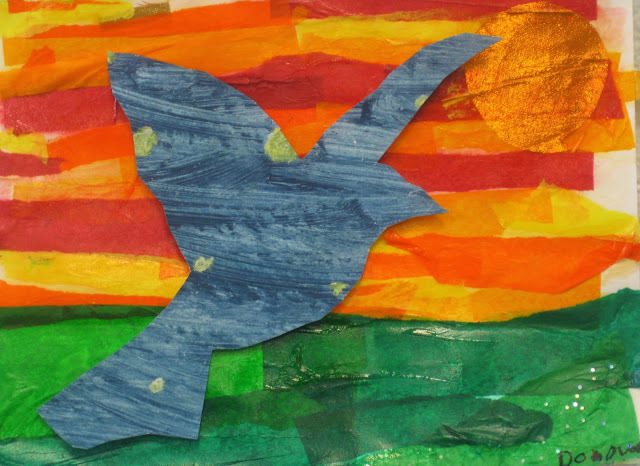 When I overhead the Deep Thoughts (not by Jack Handey) of the third graders, I knew I had to create a project that turned this spark of interest into a big fat hairy fire. You know, because the Fire Marshall isn't going to lose his sh** enough when he sees that mural. I used these couple of books to help introduce Magritte. I began by reading the fictional Dinner at Magritte's which was awesome because there is something surreal taking place in each illustration. After reading each page, we'd attempt to find just what that was. This really helped the kids understand the concept of surrealism: objects that are real but combined in such a way that they couldn't possibly be real. This was followed up with by surreal-themed art homework. Of course we had to read Mike Venezia's book on the artist. The kids love his books. 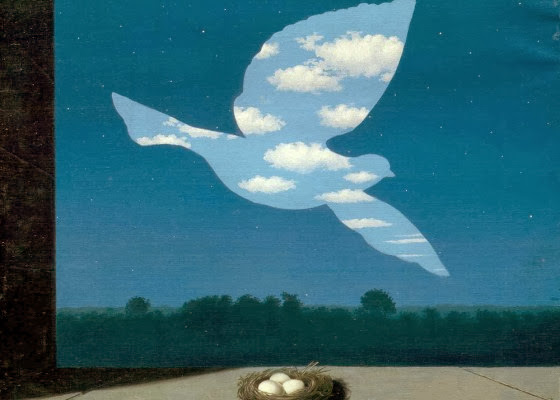 During our study of Magritte, I had the kids look at another painting of his and list all of the nouns they saw. As they said things such as bird, sky, water, ocean, sunset, clouds, etc, I wrote them down on small pieces of paper and threw them in a little box marked nouns. Then they had to come up with adjectives that described the painting and I proceeded to do the same thing. I then drew two nouns from the box and one adjective such as Clouds, Sunset, Stormy. The kids were given a small piece of paper and two minutes to create their own surreal drawing. This proved to be a short and fun assessment tool. After that, I told the kids that we'd be creating a Mega-Magritte Mural. Now, I'm all about stressing individuality in my room, as I'm sure you are too. But we had to chat about working collaboratively on this mural. I explained to them that it was like a big ole puzzle and that we all had to work together to make the pieces fit. With that in mind, the kids were given a piece of 12" X 18" piece of paper folded in half vertically. At the top, they were to use horizontal brush strokes and paint a tint of blue while at the bottom they were to paint a shade. 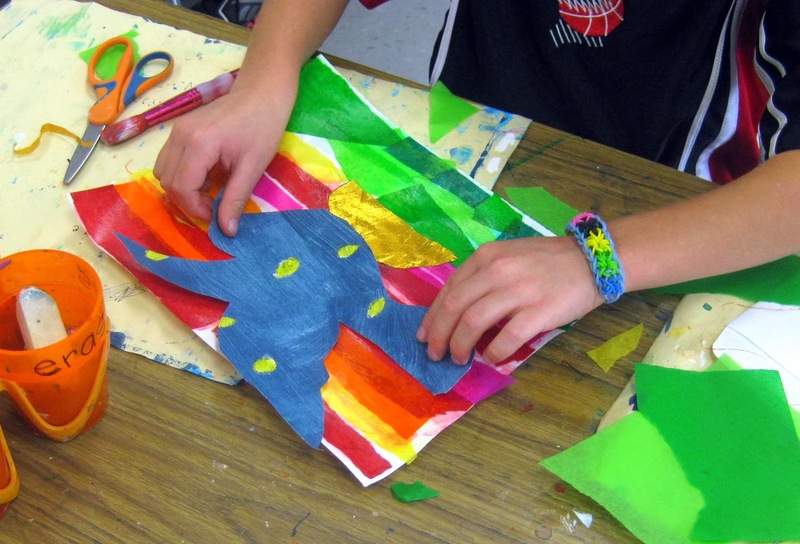 Once these dried, we added clouds and stars with oil pastels. The following art class, I placed a couple different bird templates on the tables. I thought the mural would make more sense visually if all the "daytime" birds were flying in one direction and the night in the opposite. I knew that this concept might be difficult for the kids if I didn't make my directions very clear. 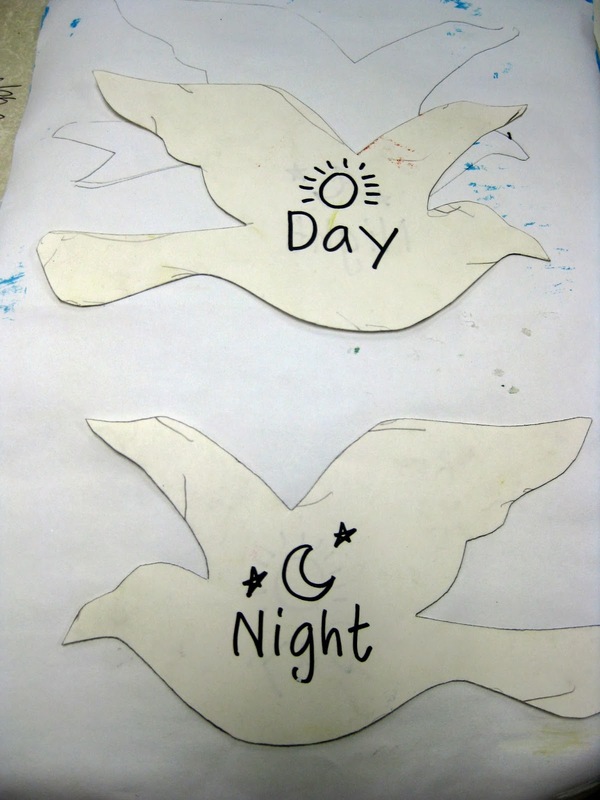 My solution was to write Day and Night on the birds. They were to use the Day birds on their daytime sky (tracing on the back to hide those unsightly pencil lines) and the Night birds on the nighttime sky. Now it just so turns out that this art project is going to be like a gift that keeps on giving. I love how their negative space papers look! I'm dreaming up another Magritte-inspired project for these pieces. Any thoughts on what they could collage/paint/write/draw in those negative spaces? By the way, the trick to getting the kids to cut so that they end up with that great negative paper was to tell them that they could only cut with one point of entry. Usually I'm all about cutting off the excess paper as I cut because it gets in the way. However, after I showed them how cool the negative paper would look, they were careful to cut slowly and only have one entry and exit point cut. This initial cut was taped back together after the bird was cut out. Now I have five 3rd grade classes with about 17 students each. At first I thought we'd need both of their birds for the mural but it turns out, they only needed to donate one. I allowed the kids to choose which one they'd like to give to the mural and which to keep for a future project (to be shared with you next week, I can't wait! ).Which is why this post it titled The Magritte Project as I think we'll end up with three pieces as a result. 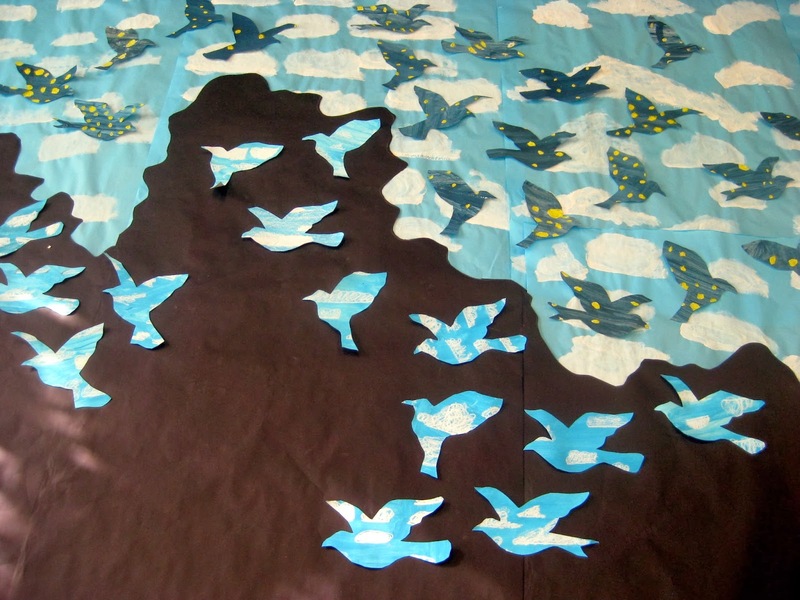 When finished with their cutting, I laid out huge pieces of blue paper for the kids to begin painting the clouds. We painted a lot of cloud papers. 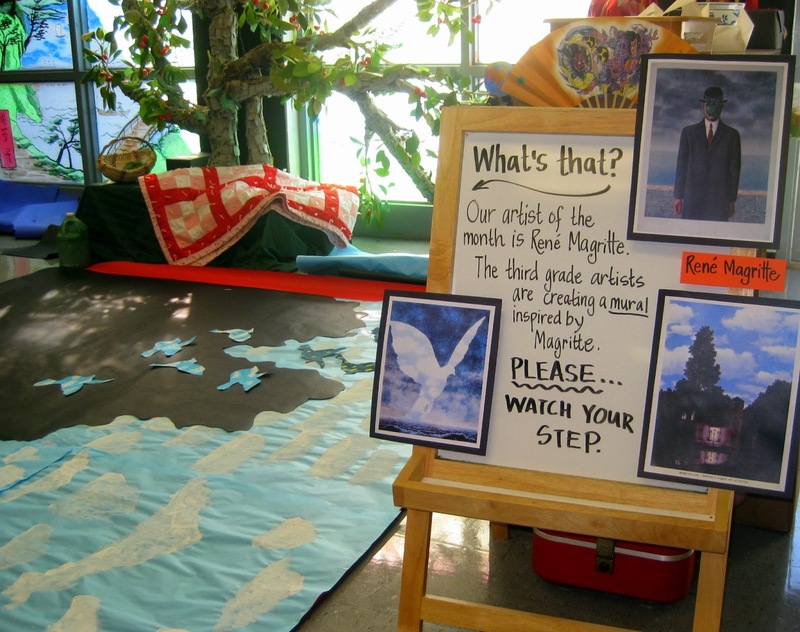 Some got used in the mural...some will be used for our display of the other Magritte-inspired masterpieces. I used black bulletin board paper and hack-cut a horizon line. 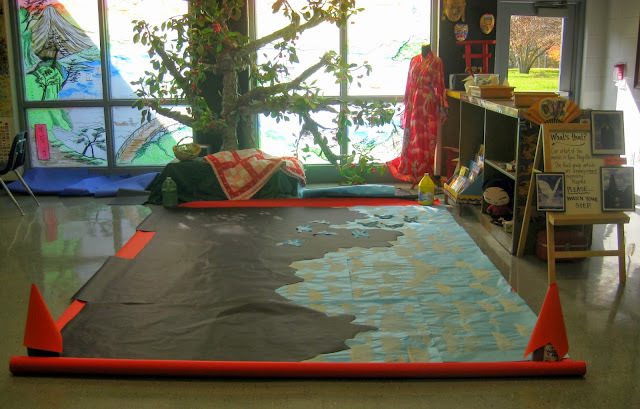 Once everything was complete, we started to day it out on the floor in the art room. Now most of my little friends know not to walk on artwork on the floor because in my art room, artwork is always all over the floor (I have a love-hate with my slightly-angled/can-cause-drips-and-paint-runs drying rack). So I also created some make-shift construction cones with orange paper and my gallon paint bottles. And I STILL had at least two kindergarteners walk right through the mural? Really?! Sigh. By the way, do you see that huge roll of orange paper my mural is on? We just happen to have a ton of this stuff and it's what we've used to glue both the Warhol mural and this one two. It works great as a base to our murals. I use a combo of spray and hot glue to adhere it to the paper. It makes my room smell magical and I see stars for up to a half hour after the fact. 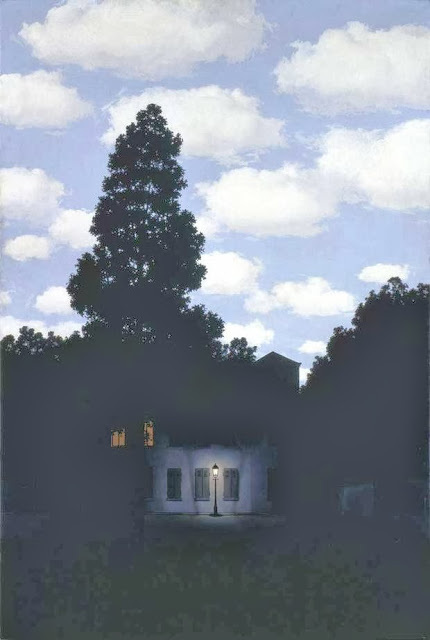 Magritte's Dominion of Light was also used as inspiration in the mural. A couple of my students painted that while others used circle sponges to create the dots. I am fortunate to have some great volunteers in the art room. They worked on hot gluing the birds in place and adhering the bulletin board paper to the large roll of orange paper. 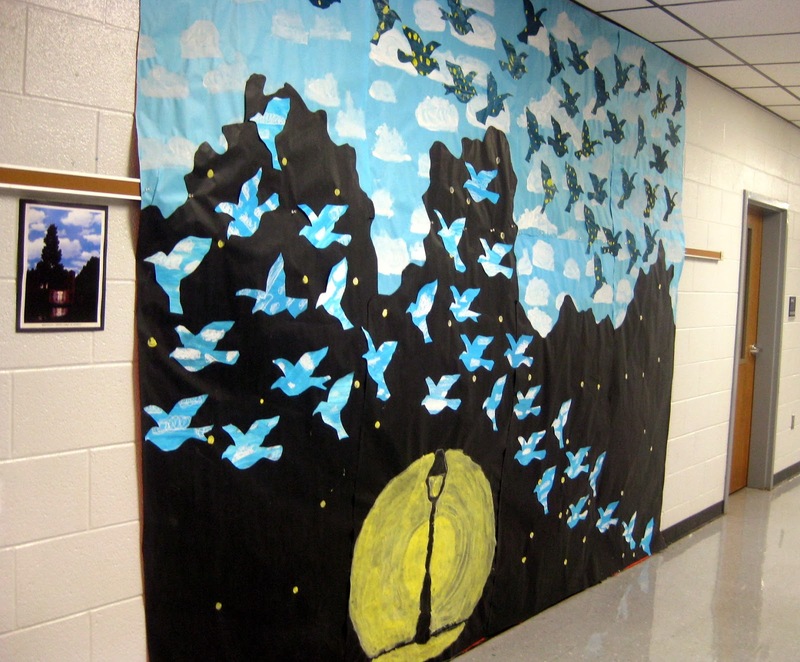 With the help of one sweet volunteer, I was able to get the mammoth mural up right outside my art room door. It so fun to see whenever I leave the art room. 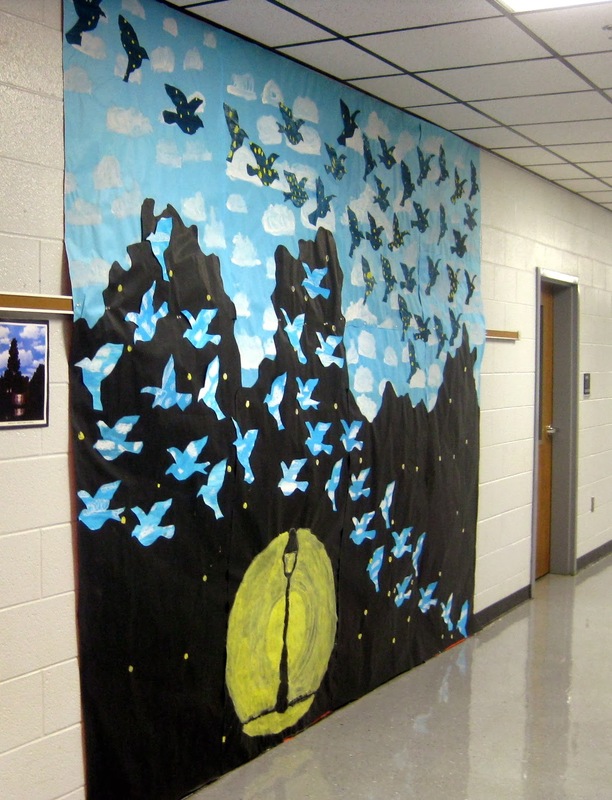 Of course, the kids were thrilled with their hard work...even if they were under the impression that their mural should "cover up" the fourth grade one. Stay tuned for more Magritte-madness. Until then, enjoy your weekend and we'll chat soon! Second Grade Gurl: Mrs. Stephens, look at me! Me: Okay. I'm looking. What? SGG: This is Thee Cutest I've been all year! (said with a flourish of the hand from her head to her feet) I NEVER get to wear cute things because, you know, I have brothers (eye roll and sigh). I had to give the poor kid a knowing nod. Say no more, sister. I taught those brothers. I'm not getting on that bus. Me: Uh, yeah you are. FGG: No! I'm going home with you! Me: Really? And what do you think we'd do at my house? Me: Sorry. I don't have a t.v. The kids is crazy. And with the full moon, the crazy weather we've been having and the fact that we are a breath away from Thanksgiving Break, the kids are even crazier. Which I didn't even think was possible. 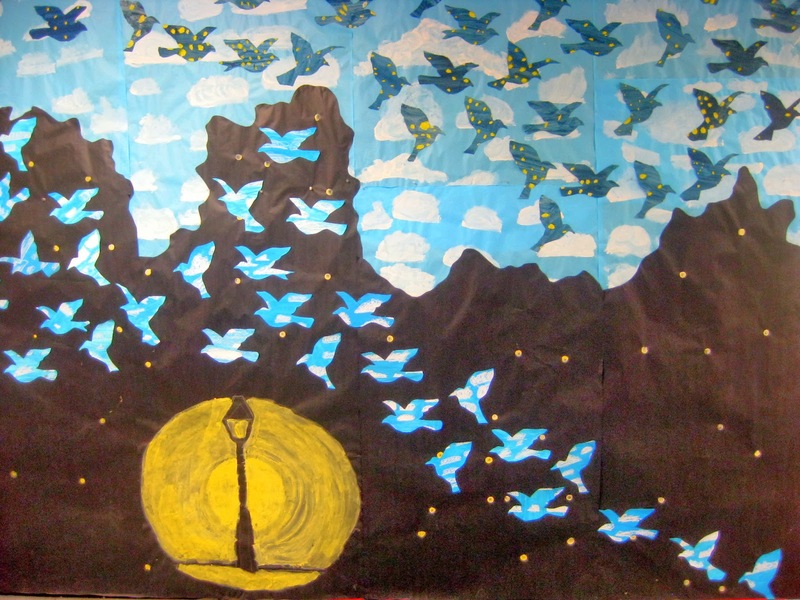 If you scroll down a pinch, you'll see the Rene Magritte-inspired mural that my third grade students have been working on. What I didn't realize until I posted that photo on Facebook and it was pointed out to me, but their mural also bears a striking resemblance to some of the work by M.C. Escher. So I thought I'd share his work with you in this here post. 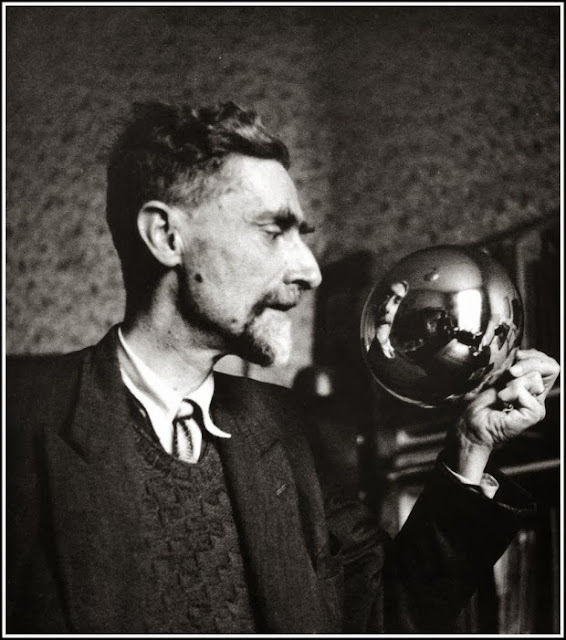 So Maurits Cornelis Escher (is it any wonder why he went by M.C.? Duh, because Master of Ceremonies, yo!) was a Dutch artist who lived from 1898 to 1972. Can you imagine living thru that time in history?! Wow, the changes he must have seen. Escher was a not considered a good student in elementary school and repeated the second grade. I can't imagine how he'd far in schools these days what with the constant testing and hoops to jump through. His genius would have been given a label. I wonder how many genius kids among us are going through that very thing right now. Okay, stepping off El Soap Box. Totally Escher-esque, right? 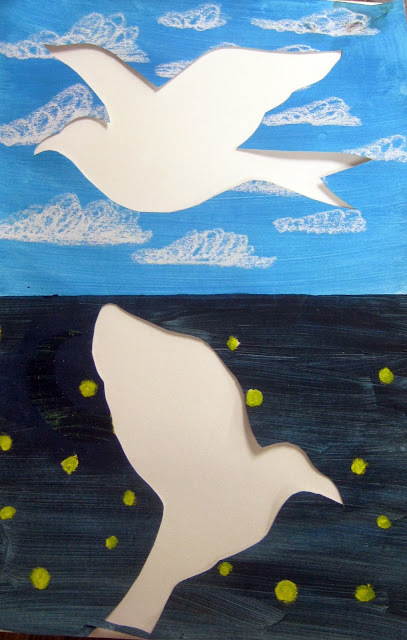 The third grade have been learning all about Rene Magritte (you can see my artist outfit here) creating these night and day birds and painting clouds for the mural. I'm hoping to have it up and ready to share with you soon. It actually looks a lot different now, this was just the kids laying out their birds. Seriously. How did I need see the connection? So it turns out that after spending some time in Italy (which just sounds lovely. Let's go, shall we? 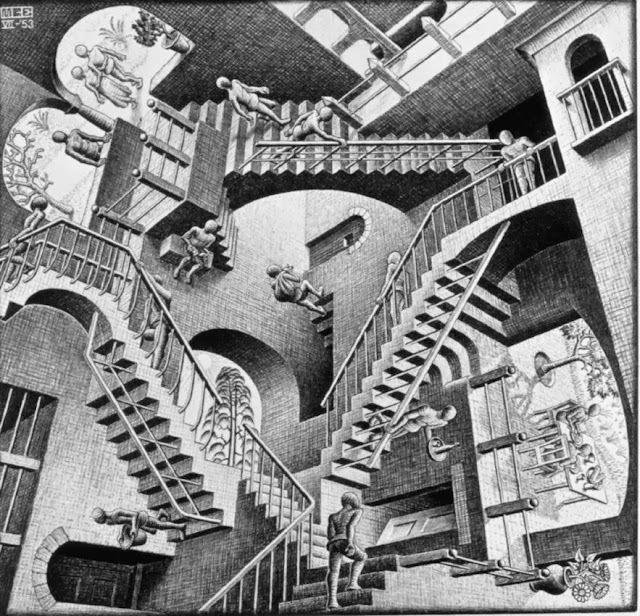 ), Escher was influenced by some intricate and geometrical designs he saw sculpted into the walls and ceiling of a castle. This sparked an interest in repetitive and interlocking patterns that would become his signature style. 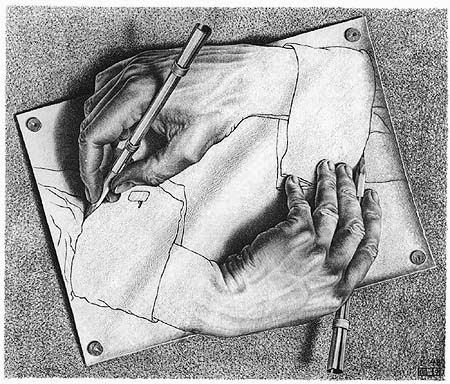 Now, I'm not much of a fan of math but it appears that those that dig math, also dig Escher. 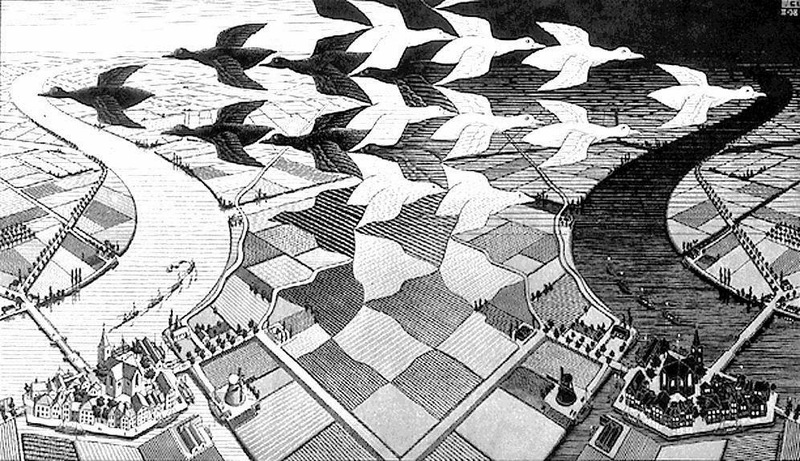 And while he wasn't trained in math, Escher had a great understanding of it visually which is best seen in his tessellations. I've always been amazed by his drawing skills and the magic of his work. 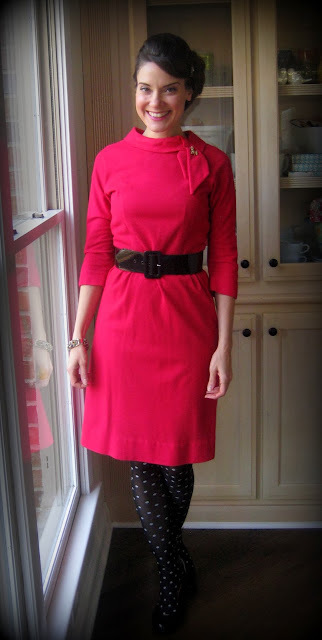 Hot Pink Thursday: This dress required that hair. It was a prerequisite. dress: vintage; tight: Target; shoes: dunno, I can't see 'em and I can't remember. That's pretty bad. I think introducing Escher to the kids will be fun. And while Escher's work appears surreal, I don't know if he really falls into that movement being that he came upon the scene later. What do you think? 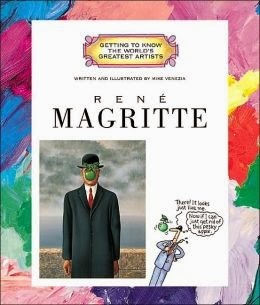 It will definitely be a fun follow up to our unit on Magritte. 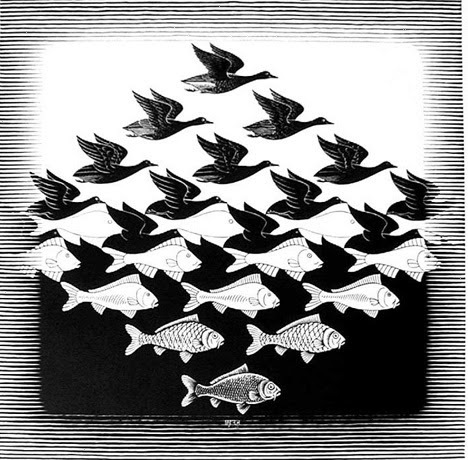 Have you art teachers taught Escher? Do you happen to have a favorite lesson that you could share because that would be totally rad. 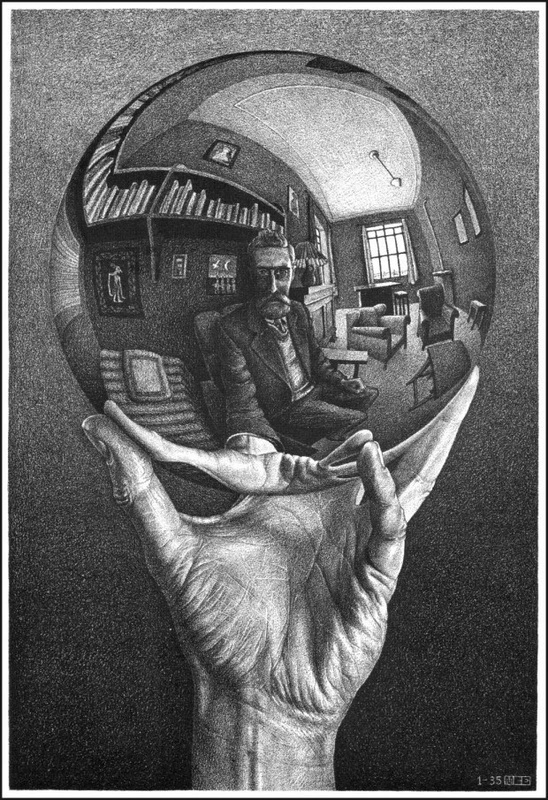 I love Escher's work. I really dug it in high school and then went through this seriously snobby phase in college because every other dip in my dorm had either an Escher or Klimt's The Kiss hanging in their room. However, after doing some digging (and uprooting my dorm room posters, ahem), I've got a new appreciation for the dude. 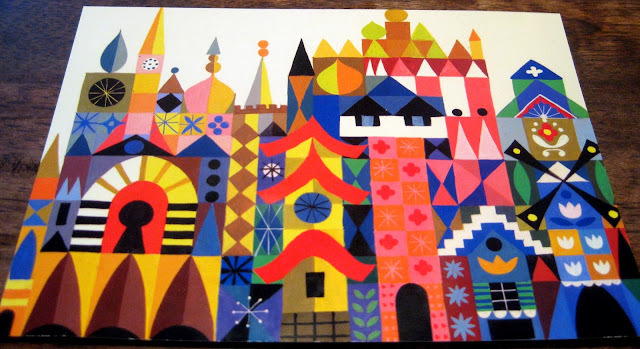 I'm excited to dream up a lesson based on the work of this incredible artist. Ya'll, Ima gonna be honest. For once in my life, I'm not in much of a talk-ie mood. So this here might be one of the most short-winded blog posts to date. Think of it as an early Christmas/Hanukkah/Kwanzaa/Winter Holiday gift from me to you. 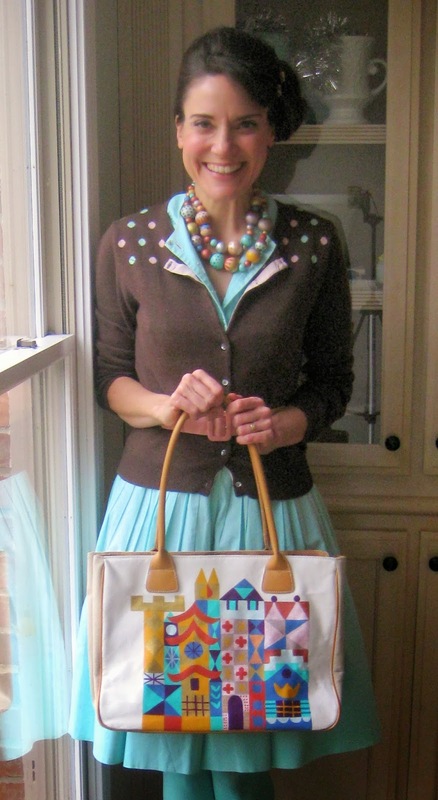 Anthropologie debuted these lovely painted bags last year. They had the look of being from actual vintage paintings and I really really wanted one...but I also really really couldn't drop that much coinage (I believe they were well over 100 bucks). And, just like all the rest of my Anthro-knock-offs, a DIY was born. 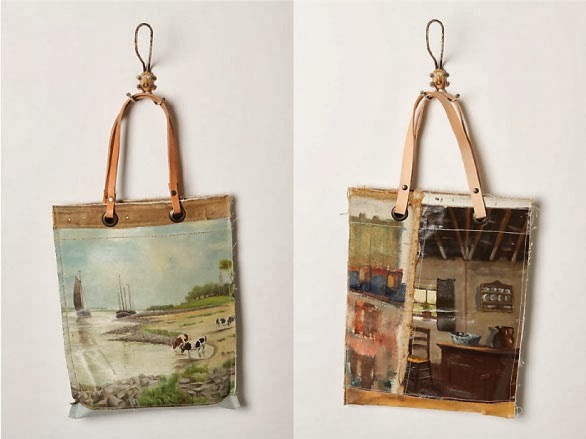 When I first spied these, I thought, well, I'll just start scouring the thrift stores for paintings and use those to create a bag. But that proved to be problematic. Firstly, I couldn't seem to find any decent paintings that weren't on black velvet. 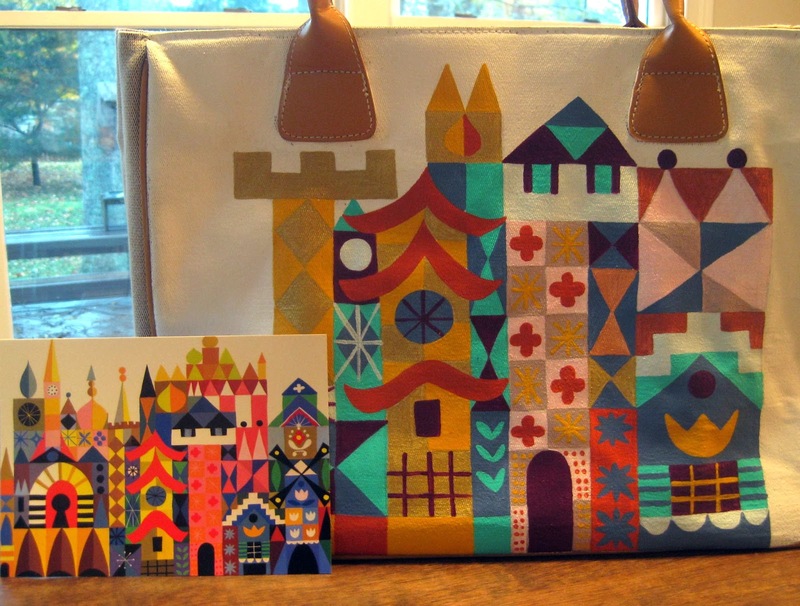 Which I actually thought might make an awesome bag and then what tiny amount of tact I have left spoke up and made herself heard with an: Um, NO. Secondly, when I did find a painting, I realized I'd probably bust needles trying to get threw the thickness of the canvas. So I shelved the idea. 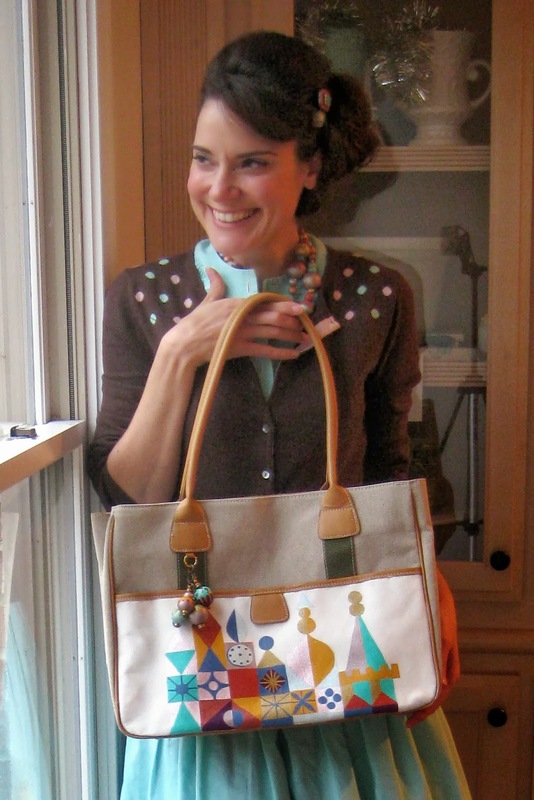 Geesh, could I look more excited about this bag? I look like they just called me down to play on The Price is Right. Which I totally wouldn't be happy about because that's gotta be the suckiest game show ever. When I stumbled upon this nondescript number at my local thrift spot, I scooped it up for a dollar and decided to paint my design onto a bag. P.S. doesn't this kinda look like a face? Tell me I'm not the only one that sees a winking man with a big beard and a wee nose. After slathering both sides of the bag with a couple coats of gesso, I struggled to come up with a design for the thing. 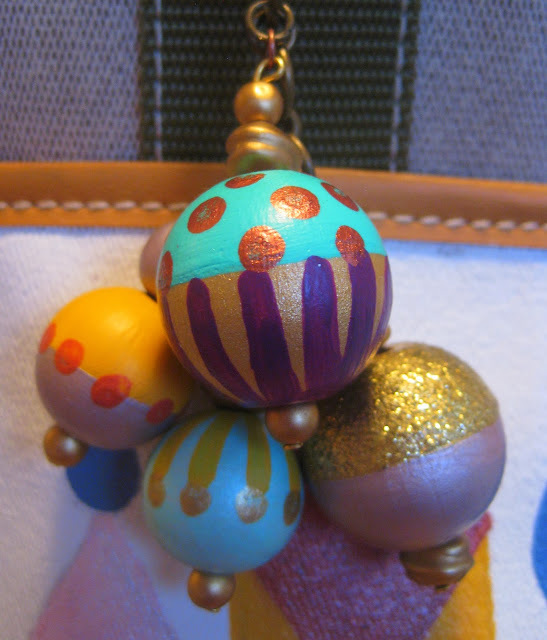 At the same time I was working on this necklace which, with it's colors and patterns, had Mary Blair's illustrations of It's a Small World on my mind. Which, if we're gonna be honest, is always on my mind. I happened to pick up a batch of postcards of her work on a recent trip to Disneyland. 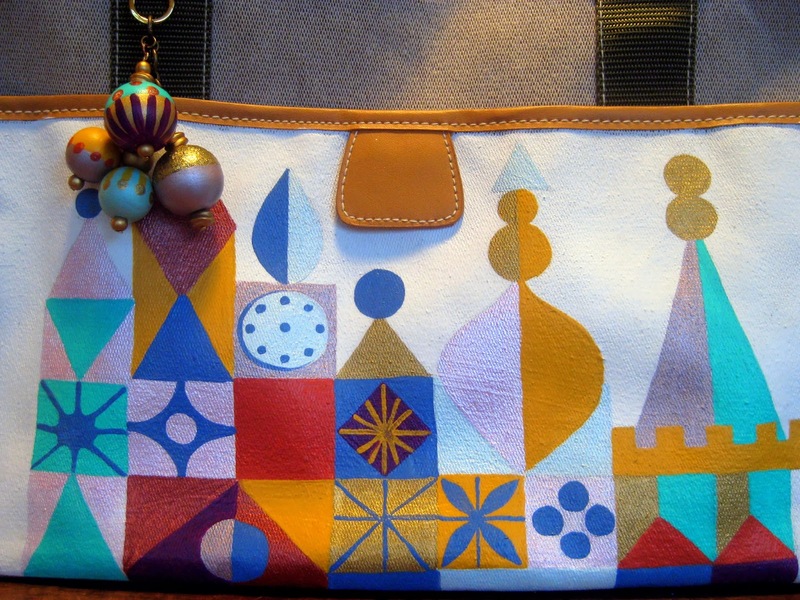 I decided I needed this sketch of Small World by Blair on my bag. I drew the whole thing out with light lines in pencil and proceeded to fill it in, paint-by-numbers style. 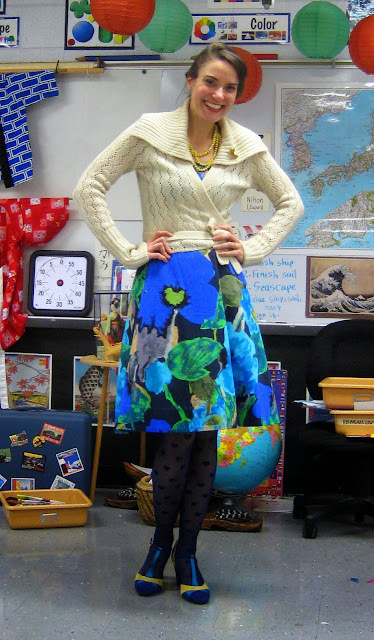 I used the exact color palette as my necklace, because as I've stated before, these are The Best Colors in the World. Painting this took longer than I'd hoped mostly because I had to give some of the painted sections multiple coats. They were cold. I had several balls to spare, ahem, from my necklace, so I used my very limited knowledge of jewelry making and added them to that little metal piece on the bag. Because it's a boy bag, it needed balls. 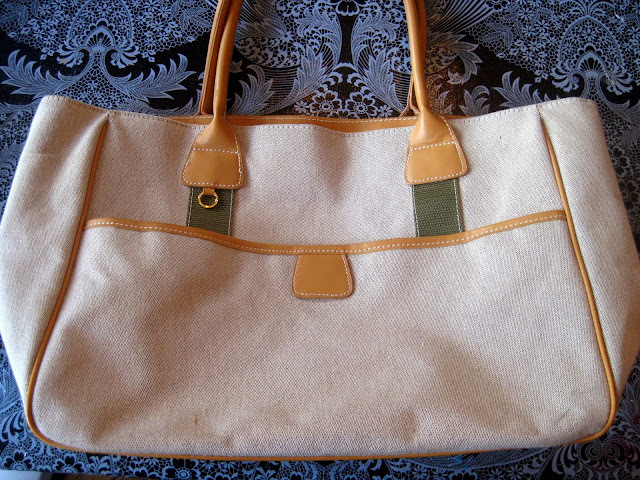 And here's what the other side of my bag looks like. I'm not sure which side I like better. This side is definitely more bold. But less ballsy. 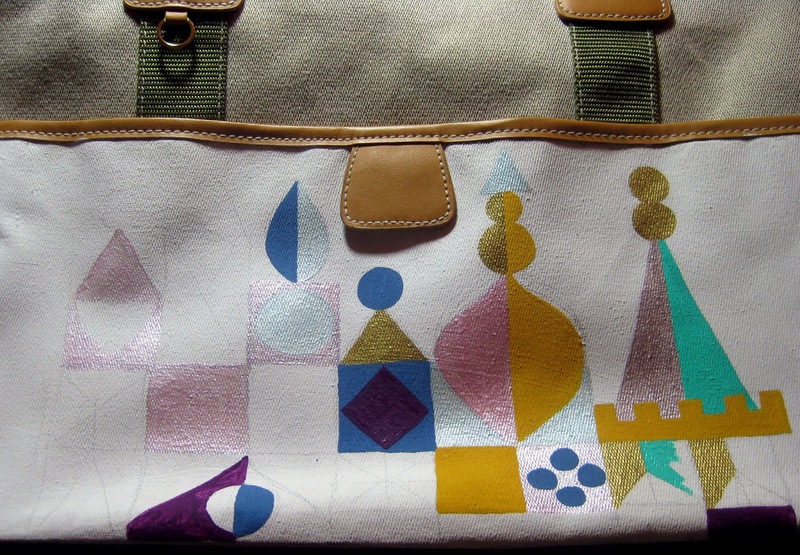 Once both sides were complete and my pencil lines were erased, I covered the bag with matte Modge Podge. I might go back and give it another coat just to insure that it doesn't get too stained or dirty. I'm not known for my cleanliness, as you can imagine. 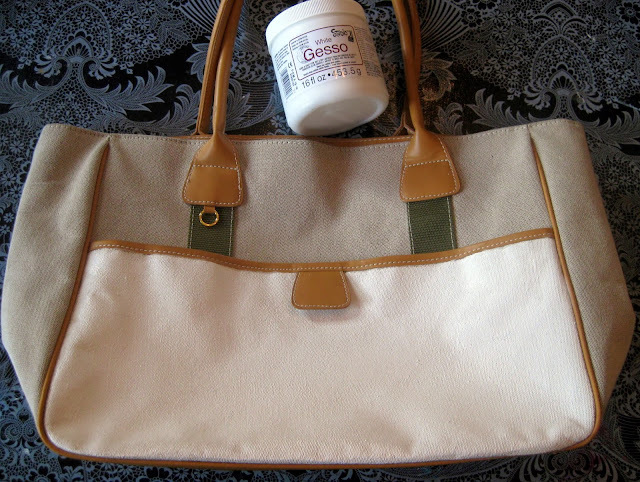 I'm a little sad that the bag appears wrinkly which I'm guessing has to do with the inflexibility of the gesso. Do you happen to have any thoughts on that? Okay, looking back, I guess I totes lied to you. This post was just as wordy as the others. My bad. Maybe next Christmas/Hanukkah/Kwanza you'll do a better job behaving and you'll fair better. Just a thought.